After the US, Europe, Australia, and South Korea, Samsung has now pushed out Galaxy Note7's battery limiting update in Canada as well. The update, in case you aren't already aware, limits the device to a maximum charge of 60%. 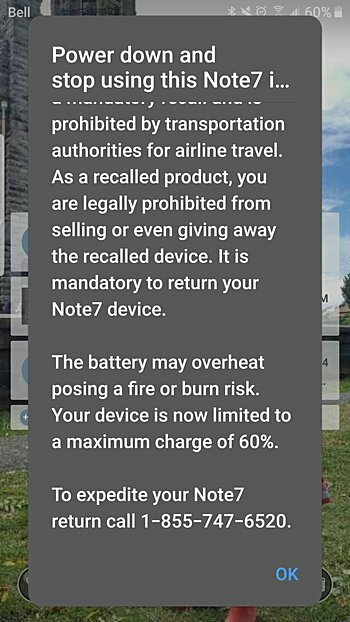 Post-update, Galaxy Note7 users in Canada should also see a reminder pop-up notification each time they charge, reboot, or turn on the screen of their device. In case you missed, the South Korean company recently revealed that around 85% of all the faulty Note7 units sold in the United States have either been returned or exchanged. In the New Zealand, the firm announced that unreturned units will be disconnected from cellular networks.